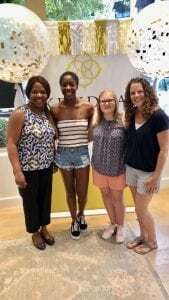 June 18, 2018 | By Fatima V.
Thank you for coming to our Sweet 16 Birthday Bash by Kendra Scott! Saturday, June 16th, Kendra Scott hosted a Sweet 16 for Children’s Miracle Network Hospitals. Dewini Jituboh and Hailey Ganster, both patients of Children’s Health, had the ability to share their Sweet 16 at Kendra Scott in Allen. Both girls had a great time meeting people and dancing with friends and family. Kendra Scott, in partnership with Children’s Miracle Network Hospitals, whose mission is to raise funds and awareness for local children’s hospitals, offered a private sale with exclusive pricing on select fine jewelry. Twenty percent of the proceeds from the event will directly support Children’s Health. Thank you Kendra Scott!